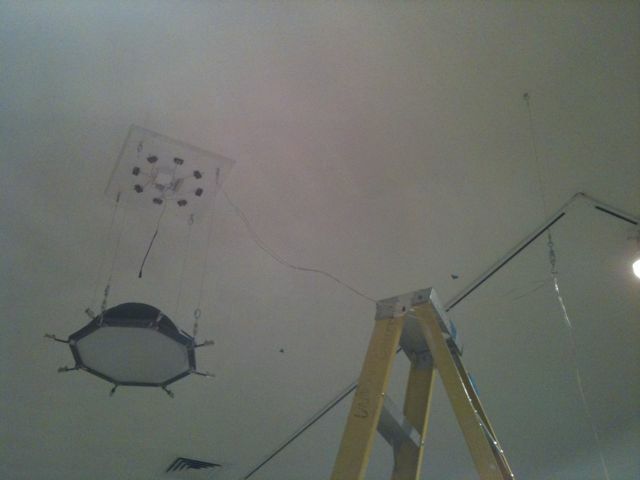 decipher, site-specific installation, was originally created for Second Street Gallery, which ceiling height is 10′. Now I need to install it in the gallery 12′ high. I used thin wires to lower the ceiling in 10′ high. Now I noticed the fact that I need to extend the wires about 10″ in order to reach the connectors. To extend the wires is easy though, it eats extra time. This entry was posted in art, exhibition and tagged art, decipher, exhibition, install. Bookmark the permalink.